Corbon Ammunition has been dedicated to growth for more than 30 years. Using proven, high-performance designs and unparalleled quality control, Corbon has become a respected name in the shooting world. This family-owned and operated business has a state-of-the-art production facility located in Sturgis, South Dakota. This package contains 20 rounds of Corbon 9mm Luger (also known as 9x19mm parabellum) ammunition. Each round is loaded with a 100 grain grain Pow’RBall hollow point projectile. Each of these unique hollow point bullets features a lead core with a specially designed cavity topped with a smooth polymer ball. The polymer ball works to initiate controlled expansion upon target impact, resulting in massive mushrooming for effective energy transfer. The round profile created by the polymer ball produces dependable penetration, even through difficult barriers like heavy clothing, glass, and even sheet metal, making these loads perfect for self-defense. This “round nose” profile also enhances feeding and function in modern semi-automatic weapons. This non-corrosive ammunition is factory fresh and features high-quality boxer primers and reloadable brass casings. Each overpressure round is loaded to +P pressures and produces a muzzle velocity of 1475 feet per second and 483 foot pounds of muzzle energy. In my Ruger SR1911 I had a hard time getting Harnady hollow points to feed. Then I put about 50 rds of the Power Ball through it no misfeeds and dead on accuracy at 21 ft. 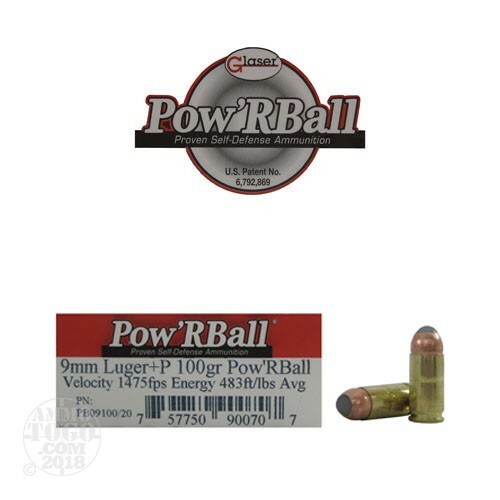 The PowerBall ammo is now my carry round. this is for Craig Adams. failuer to fire on the first hit is probley a bad fireing pin spring. to weak. you need a heaver spring. on My Glock i did a trigger job and spring kit. i used a lighter fireing pin striker spring and had the same problem in G19. so i put the factory back on it and no miss fires. check your gun out. Out of 40 rounds had 20% fail to fire on the first strike. Thats eight rounds! Even at ATG prices thats still 8 bucks. When you pay a premium price for SELF DEFENSE ammo it needs to go bang everytime! When it did fire it was very accurate, grouped well, and recoil was very manageable but I can't trust it, not in my gun. Won't jam like Gold-Dots I will eventually try the Federal Expanding FMJs too. One word. NASTY AMMO, went threw 4 sheets 3/4 inch plywood, plus 2x4, and still could not get the bullet. A lot of power may be too much.